These old fashioned coconut cream pie recipes make delicious dessert pies completely from scratch. 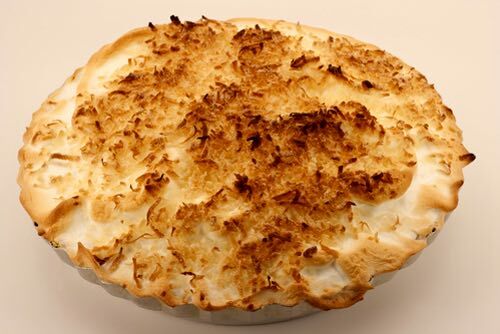 Coconut (also, cocoanut) has always been a popular ingredient for pies, especially during the latter half of the 19th century. Coconuts have been available to cooks for centuries as they were easy to transport and inexpensive to buy. For many people living in remote rural areas, they added a taste of the exotic to an often mundane life. You'll enjoy the delicious flavors of these homemade pies, especially when the coconut is freshly grated (secret method is revealed below). One-half cup desiccated coconut soaked in one cupful of milk, two eggs, one small cupful of sugar, butter the size of an egg. This is for one small-sized pie. Nice with a meringue on top. Cut off the brown part of the coconut, grate the white part, and mix it with the milk, and set it on the fire and let it boil slowly eight or ten minutes. To a pound of the grated coconut allow a quart of milk, eight eggs, four tablespoonfuls of white sugar, a glass of wine, a small cracker pounded fine, two spoonfuls of melted butter, and half a nutmeg. The eggs and sugar should be beaten together to a froth, then the wine stirred in. Put them into the milk and coconut, which should be first allowed to get quite cool; add the cracker and nutmeg, turn the whole into deep pie plates with a lining and rim of puff paste. Bake them as soon as turned into the plates. Line a pie plate with a rich puff paste. Grate up a coconut, reserving the milk. Rub a quarter of a pound of butter to a cream, add half a pound of powdered sugar and the beaten yolks of four eggs, the grated peel of a lemon, a wineglassful of brandy, and the milk of the coconut, and then add the grated coconut to this mixture. This will make two pies. Bake in open shells. Now make a meringue of the whites with pulverized sugar and spread on top. After the pie is baked and set back in the oven for a minute, you may beat up the whites to a stiff froth and mix with the coconut and bake at once. The old fashioned coconut pie recipes on this page call for grated coconut meat. Obtaining it fresh from the shell seems time-consuming, but opening a coconut is a lot easier than you might think. My easy instructions reveal the secret of how to open coconut shells almost instantly. Everyone should experience the fun of splitting open a coconut and preparing the coconut meat from scratch. It tastes so delicious when it's fresh, and it's a novel and educational experience for children. Besides, it's much fresher when grated than the prepared store-bought kind. You can substitute store-bought shredded coconut, but try opening a coconut and experience the fresh, moist flavor difference. Then, select one of these delicious coconut cream pie recipes and get ready to enjoy an old fashioned treat.